Siete entrati su un sito di Atradius. Cliccando sulle varie funzionalità ovunque su questo sito, l'utente accetta di dare in modo esplicito e automatico il consenso per l'uso dei cookie per memorizzare le informazioni, tra cui il primo cookie che è stato creato quando avete aperto questo sito web. Per ulteriori informazioni circa l'utilizzo dei cookie o come disattivarli, è possibile andare alla pagina dei cookie, andate alla pagina informativa sui cookie. Payment delays have not increased in 2017, despite many businesses suffering from decreased liquidity due to higher import prices for commodities. The Mexican chemicals industry is expected to record value added growth of 1.7% in 2018 after increasing 0.3% in 2017, driven by higher sales volumes and higher (often dollar denominated) prices. However, the peso depreciation against the USD and the Euro (a large number of chemical businesses depend on basic chemicals and/or refined oil product imports from abroad, mainly the US) and the liberalisation of fuel prices largely impact businesses results. Profit margins decreased in 2017, and further decline is expected in 2018. More than 80% of chemicals businesses in Mexico are small or medium sized, and banks often show only a moderate appetite to provide loans. The main funding vehicles in the industry are supply chains; even for larger businesses that have good access to bank credit to fund projects. The common payment terms in the industry are between 60 and 90 days. Payment delays have not increased in 2017, despite many chemical businesses suffering from decreased liquidity due to higher import prices for commodities. Higher prices were able to be passed on to clients and end-consumers. A substantial increase in payment delays and defaults is also not expected in 2018. 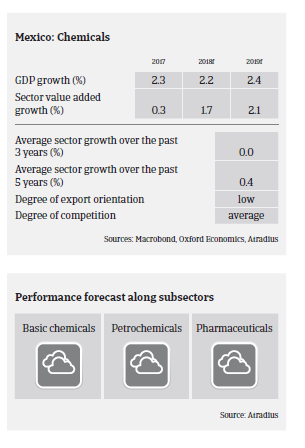 Despite higher pressure on businesses margins we maintain a neutral underwriting approach on the petrochemicals and basic chemicals segments for the time being, taking into account the robust performance seen over the the past couple of years. However, taking into account exchange rate volatility and dollar denominated prices for commodities, we closely monitor every single buyer’s performance (especially cash generation capability, leverage profile and the foreign debt/dollar denominated turnover structure). Our underwriting stance is also neutral to the pharmaceuticals sector. While businesses in this segment are usually financially robust and well eatablished, final customers such as consumers and public health institutions are susceptible to adverse economic developments. We are very restrictive on the energy and fuel sectors (gasoline, diesel, fuel distributors) due to high credit insurance claims in 2017 and early 2018. The black market for fuel trading is growing further, increasing the risk for businesses that even unknowingly buy fuel from doubtful sources. They could face problems with the authorities or become engaged in commercial disputes when the origins of the product has to be verified for tax reasons. Mexico seems to be quite resilient in dealing with the uncertainty brought by the NAFTA renegotiations due to its strong economic fundamentals. The outlook for 2018 remains subdued and the already low profit margins of many construction businesses are expected to deteriorate further in H1 of 2018. The percentage of overdue B2B invoices increased in 2018 impacting 64.1% of survey respondents in countries surveyed in the Americas.